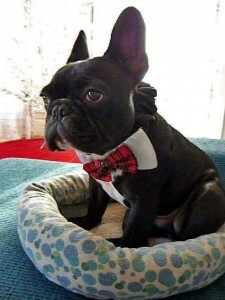 Why a french bulldog for me? I’m often told that I must have the most well groomed dog around and the answer is yes cause I picked a breed that has very minimal grooming needs. I knew that after 40 hours a week grooming the last thing I want is to groom on my personal time which is why I chose a Frenchie. A happy-go-lucky attitude and clowning behavior. Like many other companion dog breeds they require close contact with humans. They have fairly minimal exercise needs, but do require at least daily walks. Their calm nature makes them excellent choices for apartment dwellers, as does their usually sensible attitude towards barking. This entry was posted in Dog Breeds by Vanessa. Bookmark the permalink.